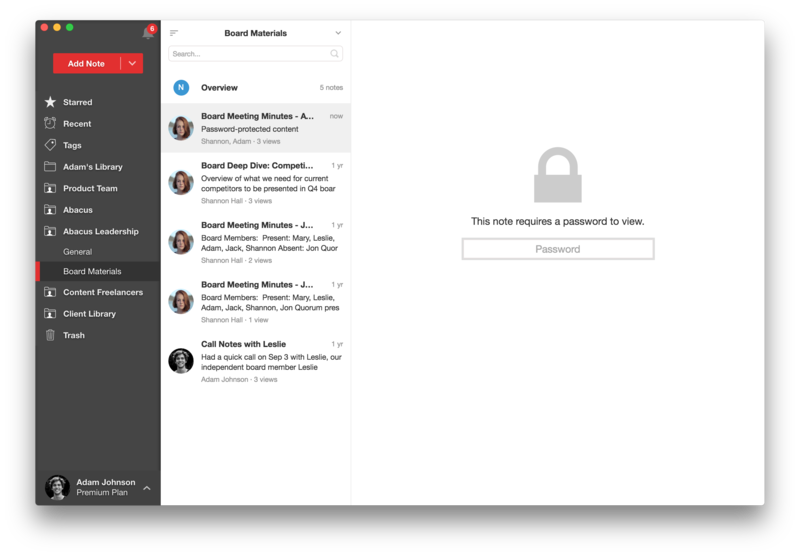 Today we are excited to launch password-protected notes, enabling you to secure a note with a custom password to prevent prying eyes. To add a password to a note, simply select Password Protect from the more actions menu in the top-right corner of a note. 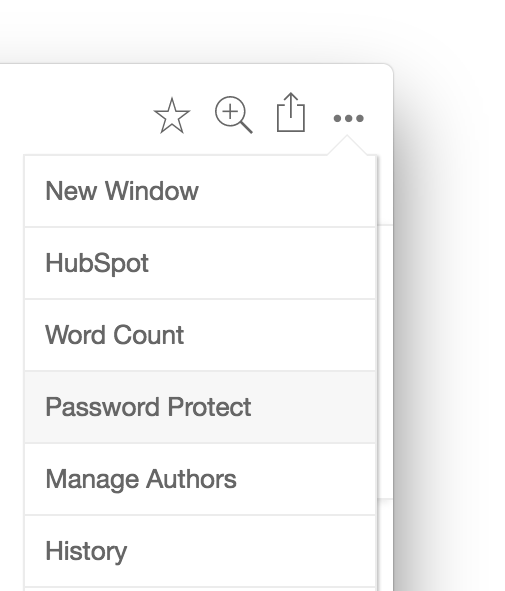 Or right-click a note in the notes list and select Password Protect. You'll be prompted to type in and confirm a custom password you'd like to set. Each note you protect can have it's own independent password separate from your login password. Now whenever you try to view this note, you'll be prompt to enter in the password before you are able to gain access. Even when you view the same note again in the same session, you'll be prompted to re-enter the password to maximize your protection. This applies across Notejoy's web, desktop, and mobile apps, as well as third-party integrations. 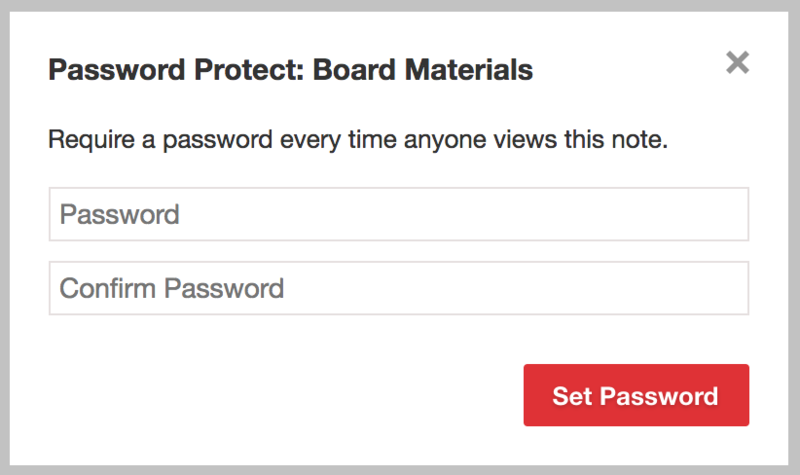 Password-protected notes can be used in both personal libraries as well as team libraries. A password-protected note can be opened by anyone on the team that knows the password. This becomes a great way to ensure only certain individuals have access to certain notes, while keeping the overall team library accessible to the broader team. Password-protected notes will still appear in search so you can easily get back to the note. If the search keyword appears in the note body, the note will be surfaced as a search result. However, the note preview will be masked and viewing the note will require the password. To remove a password, simply select Remove Password from the more actions menu or notes list context menu. If you were the original user who set the password, you'll be able to remove the password after re-entering it. 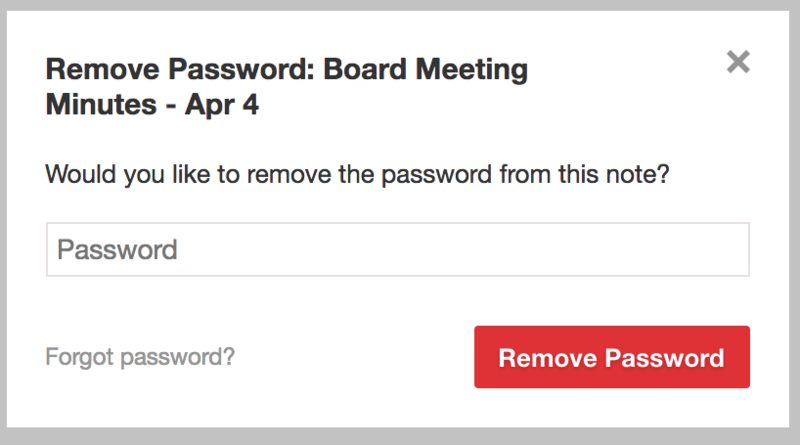 In addition, team library admins can remove the password without having to re-enter the password. If you forget the note password and you were the one who original set it, you can select Forgot password from the Remove Password dialog. This will send an email to your registered Notejoy email account in 48 hours that you can use to remove the password. The 48 hour delay is to prevent malicious users from being able to gain access to the note's content in the event they have gained access to both your Notejoy and email account. Viewing password-protected notes is supported starting in v1.5 of our iOS and Android apps. Password-protected notes is available in Notejoy Solo, Plus, and Premium plans.